"It puts everything into perspective, I used to watch Ronda Rousey kill it in the UFC and she's considered the 'Baddest Woman on the Planet' and now I get to face her, I challenged her for [the title] at WWE Money in the Bank," Jax said. "It gives me goosebumps about what's going to happen and I don't even know what's going to happen." In regards to who she'd still like to face, Jax had a number of names in mind, including a couple from NXT. "I'd love to work with Charlotte Flair, she's the best athlete in our company," Jax responded. "Some girls down in NXT, we have Bianca Belair and Aliyah. One of the newcomers, Ember Moon, she's killing it as well. Anybody from the Riott Squad." Jax wrapped up a story with her real-life friend Alexa Bliss where Bliss (along with Mickie James) bullied Nia Jax about her size and look. 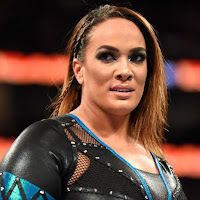 Ultimately, Jax thought it was great for WWE to have a story like that because it's something people - including herself - have to deal with in real life. "I get bullied for my size, my weight, and my look constantly," Jax said. "It's something that I glad we touched on in WWE. I'm glad we touched on it because it's real, it's something that happens in real life to kids all the time, especially in the age of cyber bullying. I'm glad we were able to touch on it and show people how to overcome, stand up for yourself, and be proud of who you are."